Jean "Johnny" Pigozzi picked up a Leica camera as an adolescent and began formulating a diarist style that revolved around his observations of upper-class life. While attending Harvard University, he made regular sojourns to New York City where he mingled with artists and tastemakers, taking photographs in close proximity. His "sophisticated snapshots," significantly influenced by Robert Frank and Helmut Newton, are candid and intimate: friends including Andy Warhol, Anjelica Huston, and Diane von Furstenberg, among others, are captured in scenes of social revelry or voluptuous leisure. Pigozzi often appears in his own photographs, affirming the role of the camera as a tool for his keen engagement with the world. The famous "blue pool" at the Pigozzi family's Villa Dorane at Cap d'Antibes has seen actors, models, musicians, and photographers since it was built in 1953. Apart from being the locus of Pigozzi's numerous photographs, glamorous birthday parties and Vogue photoshoots have also been hosted there. 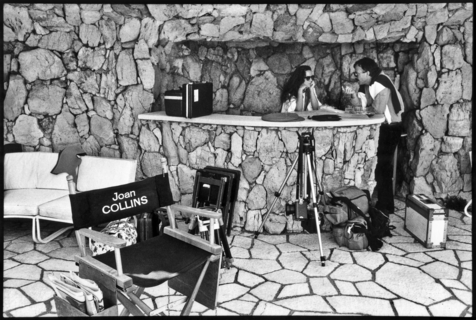 Color and black-and-white photographs of celebrities including Bono, Mick and Bianca Jagger, Elizabeth Taylor, Naomi Campbell, David Geffen, Jack Nicholson, Robert De Niro, Sharon Stone, Elle Macpherson, Helmut Newton, and Julian Schnabel are brought to life with dramatic light and playful pool-toy props, celebrating the fun and whimsy of the boisterous glitterati. The special edition Leica Sofort "LimoLand" by Jean Pigozzi will be on display at Leica Store Los Angeles throughout the duration of the exhibition. Embellished with colorfully vibrant 'Mr. Limo' graphics, the special edition Leica Sofort includes a rugged, adjustable red Easy Slider Strap with leather strap ends and protective tabs by Artisan and Artist. Click here for more information on the special edition Leica Sofort. Artist Reception | November 9, 2017, 6PM - 9PM. November 12, 2017, 11AM - 12PM. Jean Pigozzi - Jean Pigozzi's "Johnny's Pool"